Quiet Genocide reviews the legal and historical case that genocide occurred in Guatemala in 1981-1983. It includes the full text of the genocide section of a United Nations sponsored Commission on Historical Clarification in Guatemala (CEH), brokered by the UN. In its final report, the CEH's rigorously reviewed abuses throughout the whole country. However, the memory of the Guatemalan dirty war, which predated the genocide and continued for over a decade of the heightened killing, has rapidly faded from international awareness. The book renders a historical picture of the 1948 Genocide Convention and its unique status in international law. It reminds readers of the difficulty of preventing and punishing genocide as illustrated by the ongoing tragedy of Darfur; anddiscusses the evolution of international and hybrid tribunals to prosecute genocide along with war crimes and crimes against humanity. Then, it sketches a brief history of Guatemala with a focus on genocide It explores how internal and global politics were an expression of structural violence, designed to ensure cheap, abundant, and quiescent Indian labor for coffee planters.a The volume provides the commission's general considerations, legal definitions, methodology, period of analysis, and victim groups, and finds that genocide had been perpetrated against five indigenous Guatemalan groups. By translating the genocide argument of the CEH into English and framing it in a lively, accessible way, this volume recovers the past, sets the record straight, and promotes accountability. This exploratory effort provides insight into the world of transitional justice and truth commissions, and valuable insights about how to engage with the question of genocide in the future. 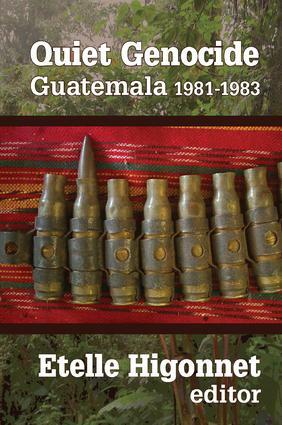 These findings shed light on a crucial and dark chapter of trans-American Cold War history, and will thus be of interest not only to scholars focused on Guatemala, but also on Central America and even more broadly, on the Cold War.